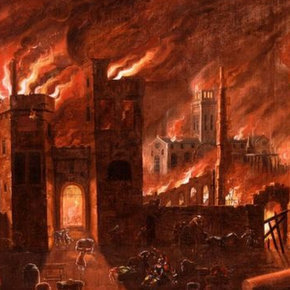 Howard Chapman marks the 350th anniversary of the Great Fire of London that destroyed most of the city, made 100,000 people homeless and ushered in new building regulations that are still keeping the capital safe. 350 years ago, in the early hours of 2nd September, a small fire in a bakery in London’s Pudding Lane resulted in catastrophic damage to the city and led to new building regulations being established, some of which are still in place today. The Great Fire of London spread quickly – a combination of a strong wind, closely built properties and a warm summer which had dried out the wood and thatch used to construct many of the buildings. An area of a mile and a half along the River Thames was almost completely destroyed. upper floors of houses were no longer permitted to jut out over the floor below. all houses or buildings, whether great or small, were to be built only in brick or stone – if new houses were built of other materials they would be pulled down, meaning no more building with wood and thatch*. new Fire Prevention Regulations included easy access to water and the beginnings of a fire hydrant system for the city. * The only exception is the modern reconstruction of Shakespeare’s Globe theatre, opened in 1997. The 1667 Building Regs were waived so it could be built with original materials. Post 1666, Sir Christopher Wren oversaw the rebuilding of 52 churches, 36 company halls, and the Monument, a memorial to the great fire. But his plans for new city of wide boulevards were scuppered by people returning to their original plots and beginning to re-build immediately. Within 10 years, the area destroyed by fire had been rebuilt. The street layout remained mostly the same but with bigger buildings mostly built in stone. Now, at the beginning of the 21st century, the City of London continues to renew itself on an ever larger scale with tall towers but still constrained by the same old street layouts and by some of the building regulations established after the Great Fire of London 350 years ago. Visit the Museum of London’s new FIRE, FIRE! exhibition for more on how the fire left its mark on the capital and the lasting legacy of Building Regulations.